Who doesn’t love a good crunchy snack? Grab yourself a little bowl and settle in to watch a movie, read a book, or play a game. There’s just something so satisfying about that crunch! My go-to used to be a handful of store-bought crackers, but switching to a real food diet took that off the table. Fortunately, making your own crunchy snacks is super easy! 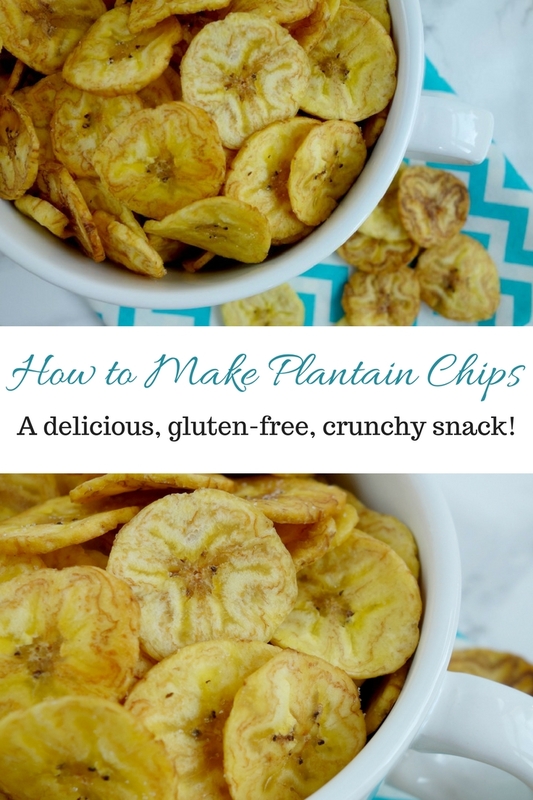 Today’s recipe for how to make plantain chips is a great example. Plantains are very similar to bananas but are so much more versatile. They are delicious at any stage of ripeness, being more starchy when they are green, slightly starchy and sweet when yellow, and very sweet when they are black. You really can’t lose with these guys! 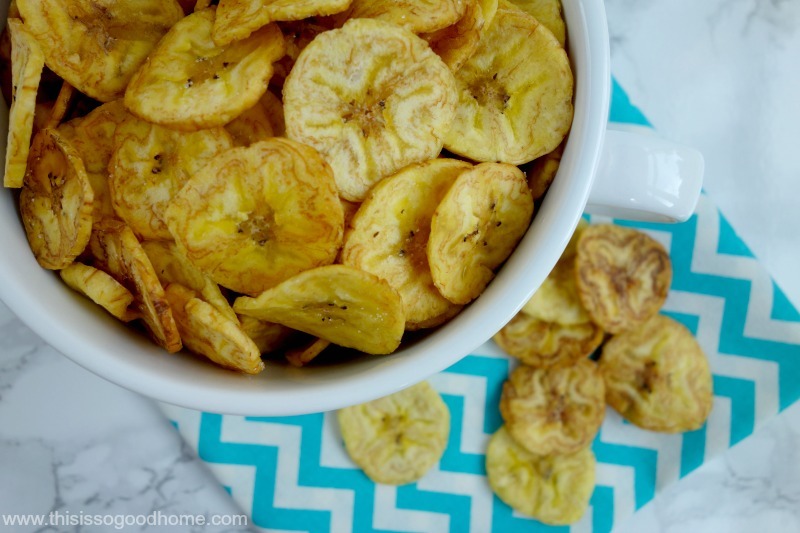 To make plantain chips, you will want to grab some green or slightly yellow plantains. The fruit will be firmer and easier to cut into perfect little chips. A yellow or black plantain, although delicious, will be too soft for this recipe. A mandoline will make quick work of the slicing, but a steady hand and a sharp knife will work just as well. Take care to make your slices evenly thick so they will all crisp up well. These chips are fried up in coconut oil, making them a much healthier choice than any store-bought item made with industrial seed oils. Of course, there are no other questionable ingredients in your homemade product AND you get to flavor them to your liking – bonus!! I love them with a sprinkle of sea salt, but the options are endless. A dash of cinnamon for a sweet kick, some cumin and paprika for a savory spin, or some cayenne or chipotle for a spicy kick! Be daring and get creative! Plantain chips are also perfect for dipping. My favorite pairing is a simple guacamole, but they are also delicious with hummus or yogurt-based dips! 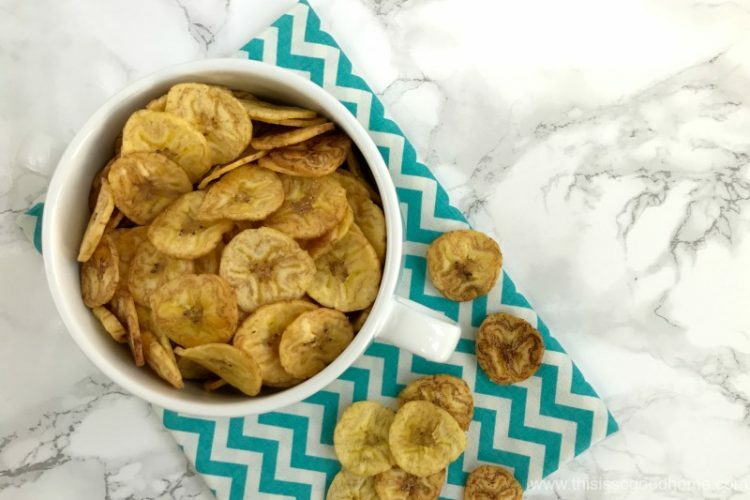 Once you’ve given these plantain chips a try, I hope you are inspired to try out some of my other homemade chip recipes. For a colorful spin on traditional potato chips, check out my recipe for homemade baked veggie chips. For the zucchini from your garden or the farmer’s market, give my garlic and herb zucchini chips a try! Heat the coconut oil in a large skillet, making sure you add enough oil to cover the plantains when you add them to the pan. Heat the oil over medium heat for 4-5 minutes. Carefully add the plantain slices in a single layer, making sure they are just barely covered by the oil. Fry them for 2 minutes. Use a slotted spoon or a spatula to flip over the slices and fry for another 1-2 minutes or until they are lightly browned. Remove the chips to a paper towel-lined plate and sprinkle with sea salt and your seasonings immediately. Let the chips cool (this only takes a few minutes) before moving them to a bowl. Continue frying the chips in batches, seasoning as you remove them from the oil. Enjoy as is or with your favorite dips! If you happen to have some leftovers, store in an airtight container. If you enjoyed today’s recipe, make sure to follow us on Pinterest for more delicious recipes just like this one! Sometimes You Just Need a Good Snack! Are you new to a real foods diet or just bored with eating the same thing every day? Are you in need of healthy snack ideas for your whole family? Would you like recipes that are easy, delicious, and healthy? If you answered yes to any of these, then my eBook, Gluten-Free Snacks, is for YOU! This book features delicious real food snack recipes from an established community of real food bloggers. All of the recipes featured in this ebook are tried and true recipes that have been put to the test of both preparation and taste. Long before blogging and social networks, trading recipes has been a way to connect and transfer culture, nourishment, and love from the heart of the home (the kitchen) to others. So, in the spirit of old-fashioned cookbooks produced by schools and churches, each cook featured in this book has provided her BEST recipe, so it winds up a collection of the best of the best! You will love all the new ideas and new flavors in this book. Clear, easy to follow instructions, beautiful photographs, and accessible ingredients will make this book a favorite resource. Feed your family healthy and nourishing gluten-free snacks every day without sacrificing taste! These snacks are a great way to add variety to your family’s diet. Healthy snacks are what keep us going between meal times, giving us the energy and sustainable blood sugar that we need to power through our to-do list. It’s time to ditch the food boredom and embrace deliciousness once again! The Gluten-Free Snacks eBook is your ticket to healthy, delicious, well-balanced snacks to keep you energized and focused no matter the time of day or activities you’re enjoying! 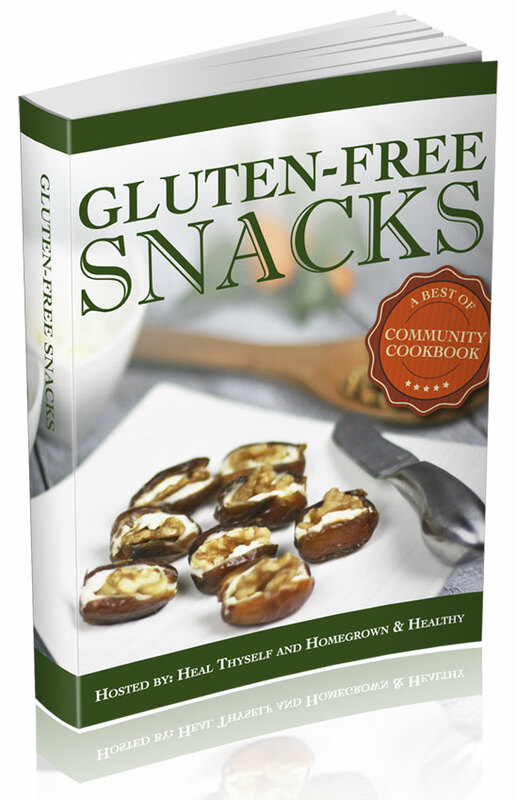 Learn more about this eBook and how to download your copy of Gluten-Free Snacks here (or click on the image below).